So that I would be on time—and because I really had nothing else to do but start getting to know my way around the city—I decided to try to figure out where her office was beforehand while just wandering about, getting the lay of the land. And the water. The old city of Chiang Mai is encircled by a moat, and Gary’s (yes, a woman named Gary) office was somewhere along it but my map was not good enough for me to know where—north, south, east or west. And so I ended up spending the whole afternoon walking the entire perimeter of the old city only to find that the place I’d been looking for had been right back where I’d started. I’d missed it because I was looking for the ‘Jet’ gas station, which had apparently changed its name. Now, when things such as this happen I like to say that I hope they are not metaphors for my life. And it’s true, I really do hope that. I’m just not sure, in this case, where the gas station part fits in. 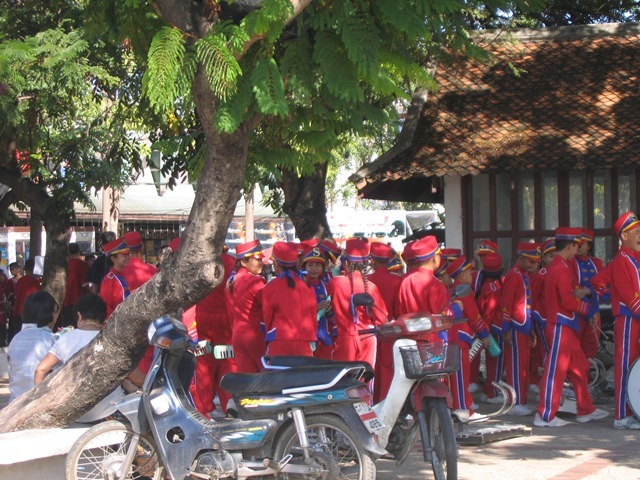 In any case, on my walk I saw a bunch of elementary-school aged kids in bright red and blue uniforms holding instruments. Cool, I thought. Marching band practice on the moat! They were getting into formation so I decided to take some photos and as I did I noticed an entire Casio section. 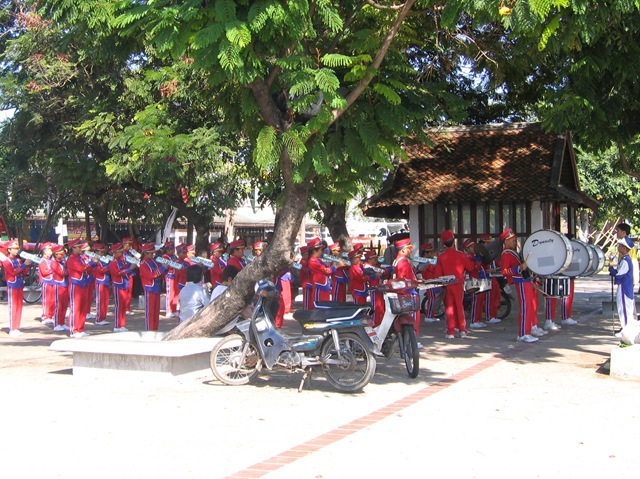 Some marching bands have a horn section, a percussion section. This one had a Casio section. Tiny little keyboards hung on shoulder straps and slung over the kids’ hips. Loved that. The Casio section is on the left. Apparently the correct position for playing one’s Casio is to rest it on the shoulder like a violin. Well, to my surprise—indeed, shock, consternation, horror, amazement and I don’t know what else—the first few notes were played and I recognized the song immediately. But no, I thought, it couldn’t be. I mean, how could it be? This is a school marching band. In 2008. In Thailand. But there it was and there was no mistaking it: they were playing ‘The Final Countdown,’ by Europe. I apologize that I have only photos and no audio for you. You’ll just have to use your imagination. If you dare. *Speaking of the national anthem, it’s a point of interest to note that it is played in some places every day at 6 pm (and I believe at an appointed hour in the morning as well—clearly one at which I am never awake), and when it comes on everyone within earshot literally drops what they are doing and stands silently until the song is over. This is amazing to observe, especially when you are in an extremely busy market. It’s like suddenly time stands still. It in fact reminded me of these great stunts by Improv Everywhere (one in Grand Central Station and one in Home Depot) and, indeed, if I were in the States and it happened I would assume it was some kind of practical joke.